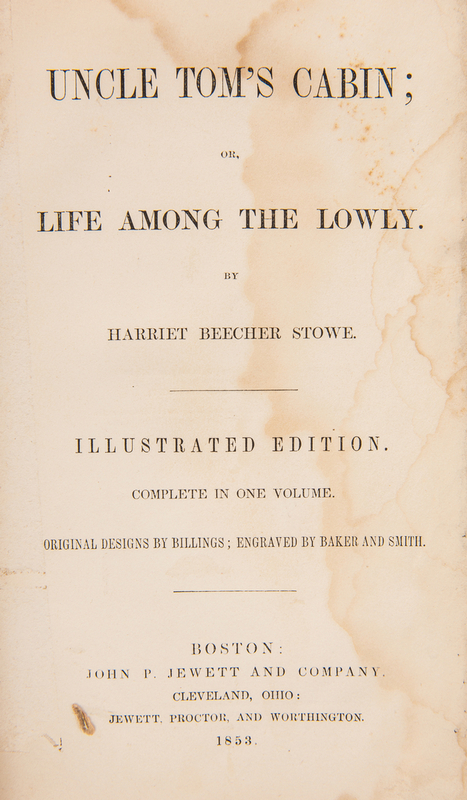 Two (2) Harriet Beecher Stowe related books. 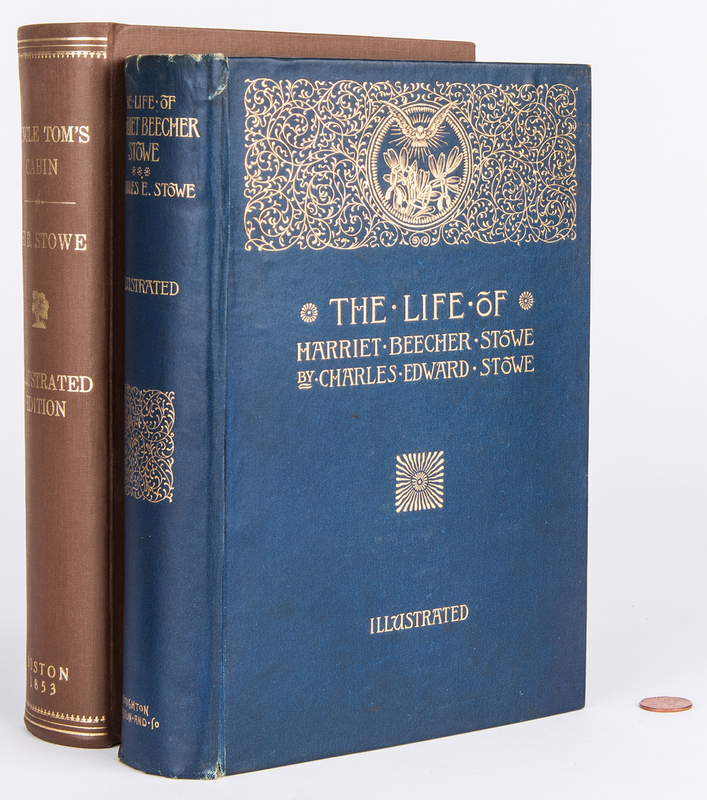 1st item: Life of Harriet Beecher Stowe, 1st Edition, by Charles Edward Stowe, 1890. Published by Houghton Mifflin Company, The Riverside Press, Boston. 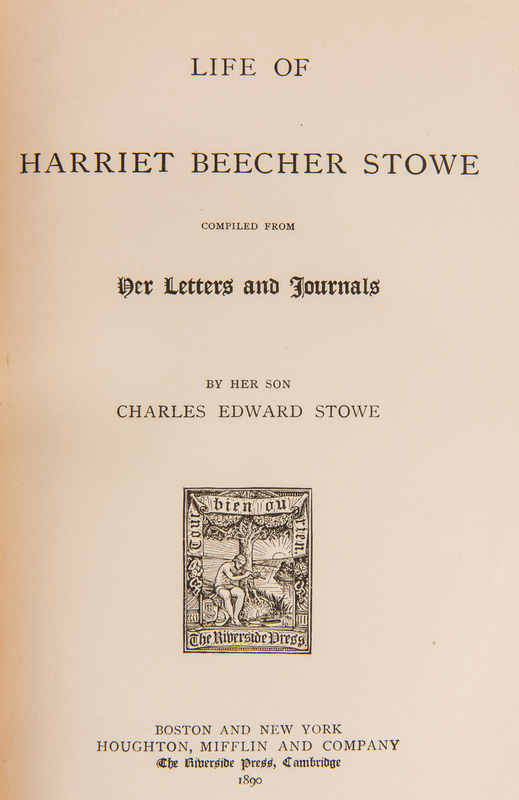 Octavo, 530 pages including index and illustrations, steel engraved frontispiece of Stowe and facsimile handwritten letter by Harriet Beecher Stowe, hardbound in tooled blue covers with gilt lettering and pictorial design to covers and spine, gilt edged paper. 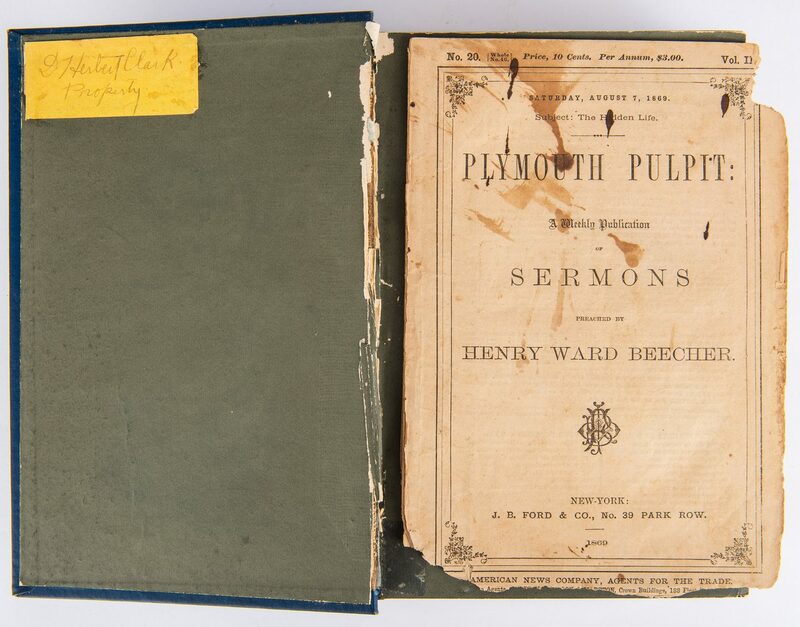 Includes a copy of "Plymouth Pulpit: A Weekly Publication of Sermons Preached by Henry Ward Beecher", Vol. II, No. 29, Published by J. 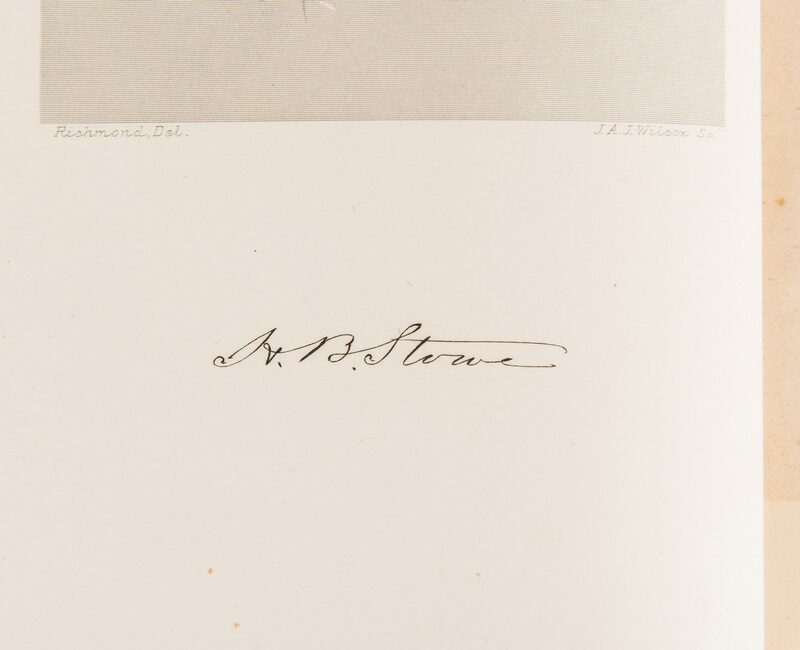 B. Ford and Company, New York, Saturday, August 7, 1869. 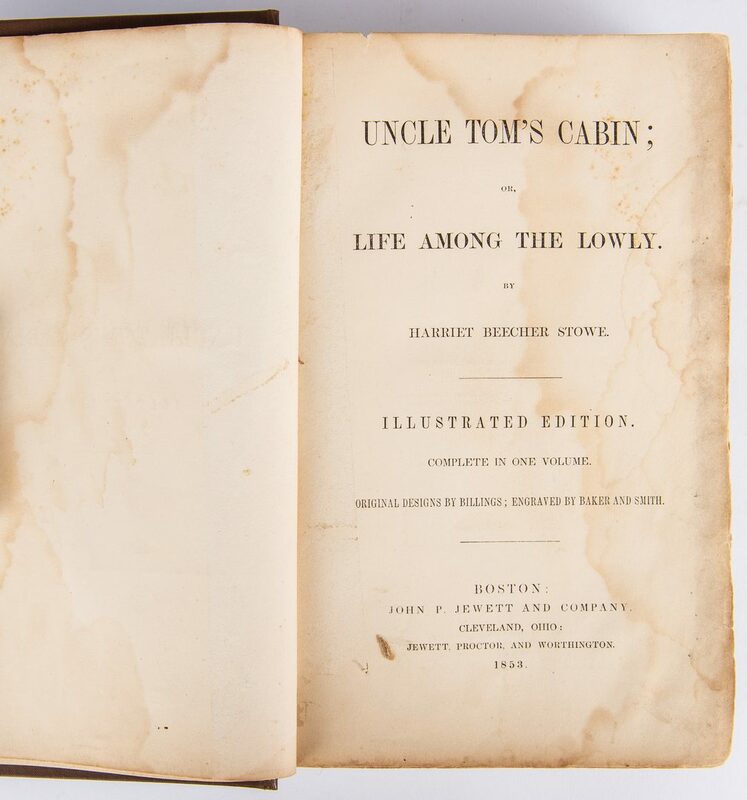 Book – 9" H x 6 1/2" W x 2" D. Pamphlet – 8 1/2" H x 5 7/8" W. 2nd item: Uncle Tom's Cabin; Or, Life Among the Lowly, Illustrated Edition, by Harriet Beecher Stowe, 1853. 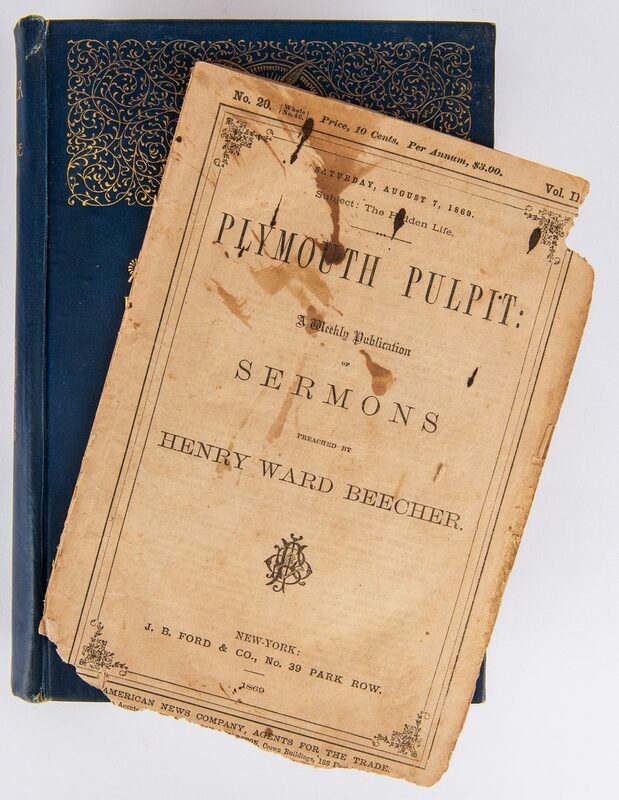 Published by John P. Jewett and Company, Boston, Jewett, Proctor, and Worthington, Cleveland. 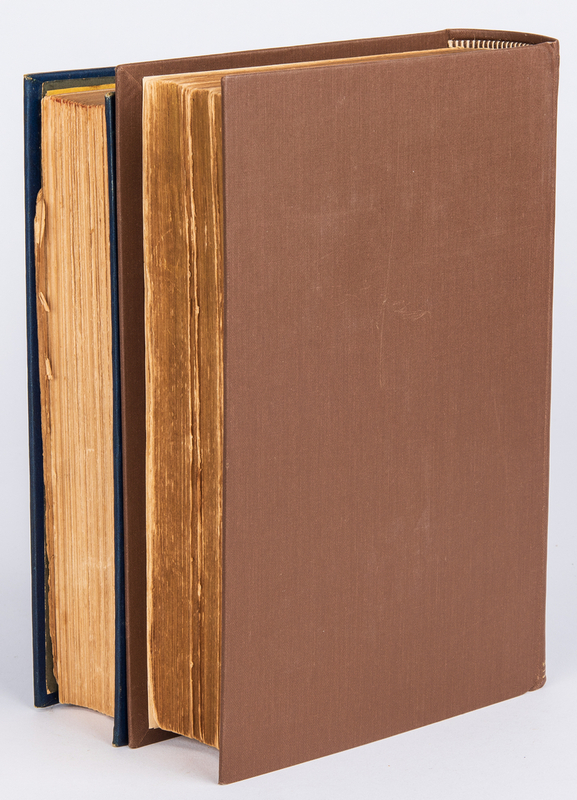 Octavo, 560 pages including illustrations, hardbound in brown covers with gilt lettering to spine, gilt top edge paper. 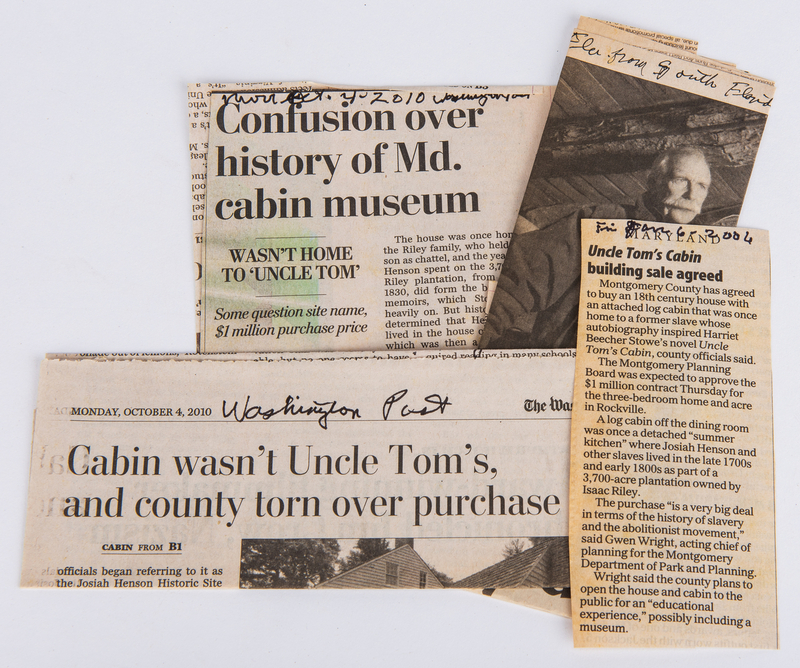 Includes four newspaper clippings related to Uncle Tom's Cabin collected by the previous owner. 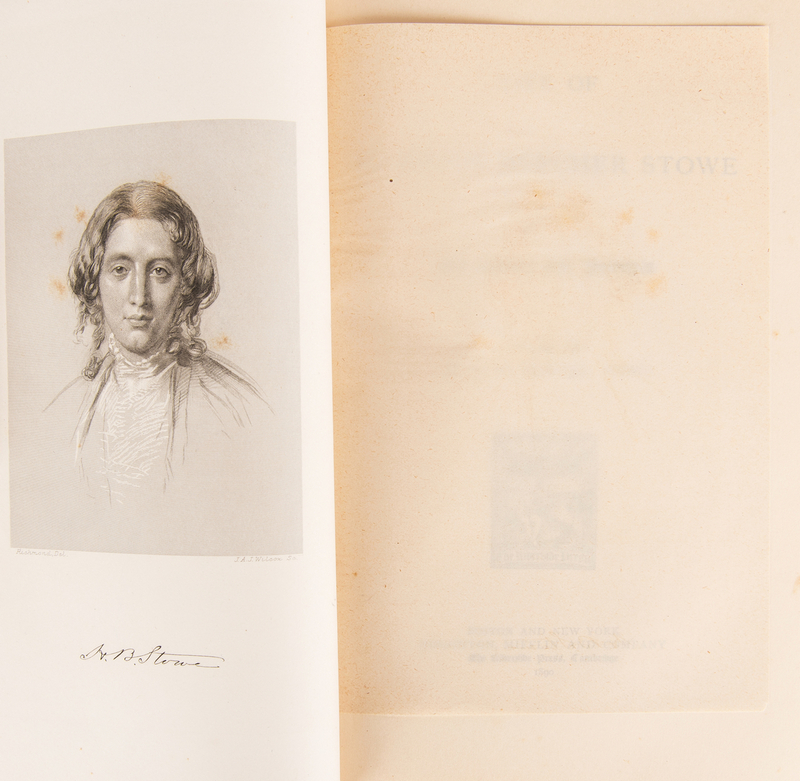 S. Russel Hawe Bookbinder, Lorton, VA label, interior of back cover. 9 1/2" H x 6 3/8" W x 2" D. Provenance: The collection of internationally known ragtime pianist and historian Johnny Maddox, Gallatin, TN. CONDITION: 1st item: Overall good condition with normal shelf wear to covers, spine. Yellow label from previous owner, pasted interior of front cover. Areas of loss, largest 5 7/8", separation from binding, 1 1/2" piece of scotch tape, stains, front and back of grey end papers. 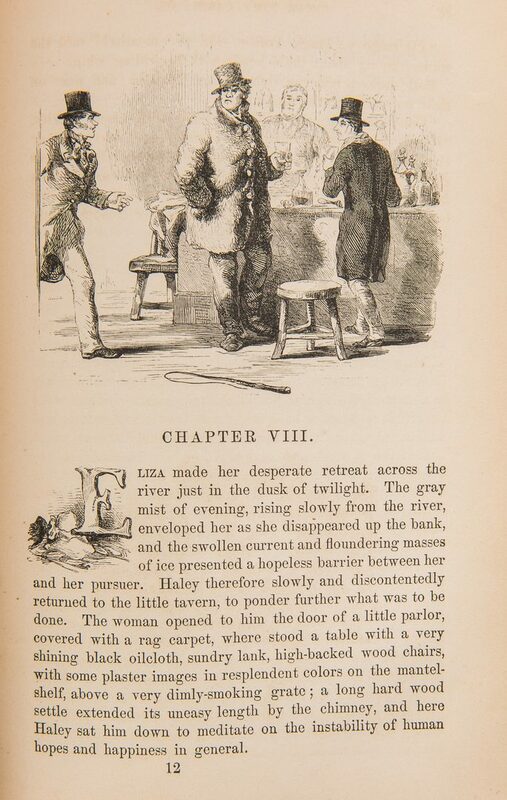 Foxing spots to first few pages including frontispiece. Majority of pages in overall very good condition. Areas of loss, including bottom 1" x 6" section of pamphlet missing (does not affect legibility of majority of pages) with stains, tears, etc. to be expected from age. 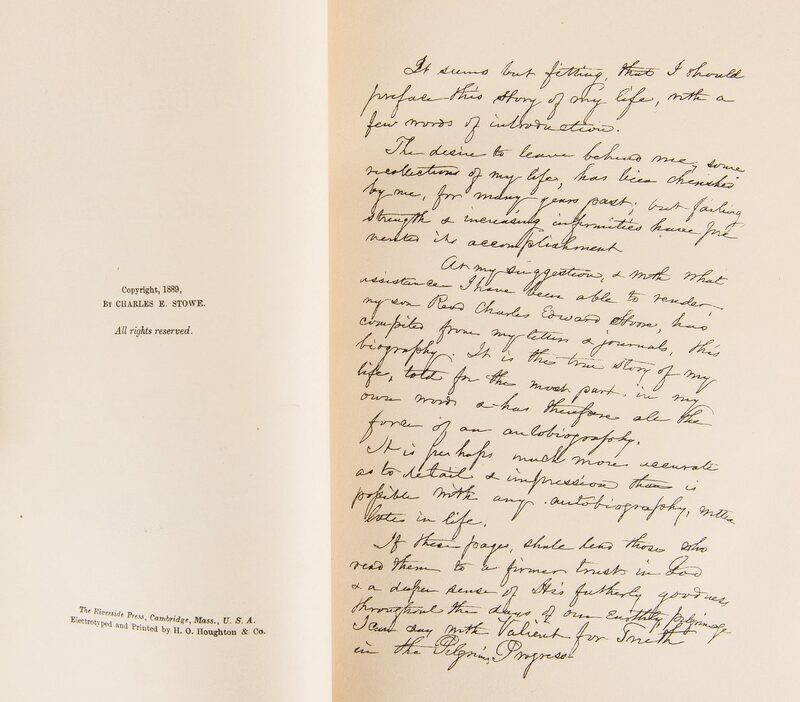 Stitching intact, all pages appear to be present. 2nd item: Overall good condition. Rebound in modern materials. Foxing spots, areas of dampstaining to first and last several pages. 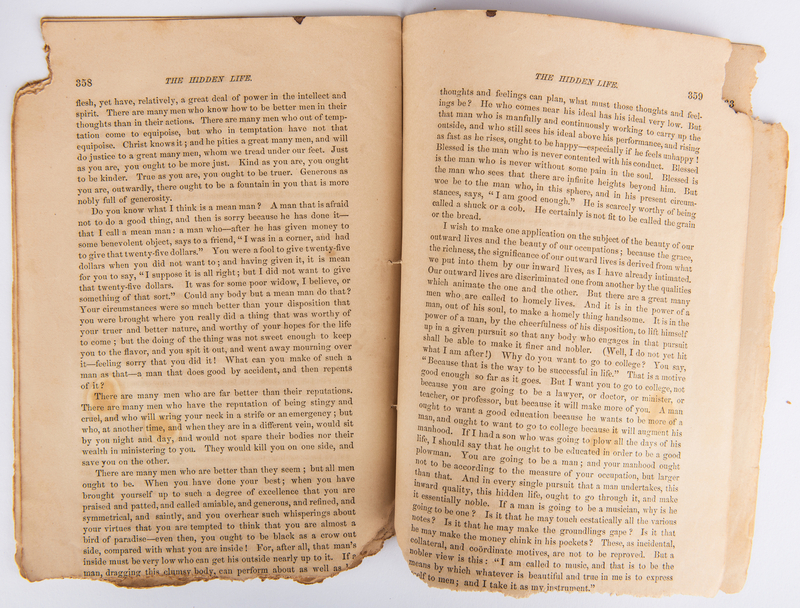 Innermost pages in overall good condition, one page with old scotch tape repair.